This article shows how is possible to exploit an active directory system by a simple phishing campaign. For this scope I will use metasploit framework: you must know the password (there are different way to stole the password but it is out the scope) of a domain user and have an Active Directory with MS14-68 vulnerability. The goal is to increase the awareness of system administrator about the risk not to patch the systems: the only way to defense from this attack. The client exploited is used for forwarding the traffic to Active Directory (this is called pivot attack) exploiting the MS14-68 vulnerability. The goal is to get a Kerberos ticket of Administrator user knowing only the password of a domain user: wonderful. Exploit the Active Directory system using the crafted kerberos ticket. The picture below shows the scenario involved in the article. The step one is described in the http://www.securityandit.com/security/excel-malware-with-metasploit/. Let’s start, before describing the step 2, to explain in what consists the MS14-68 bug. The Active Directory stores the authorization data in a field of ticket called PAC (Privilege Account Certificate). 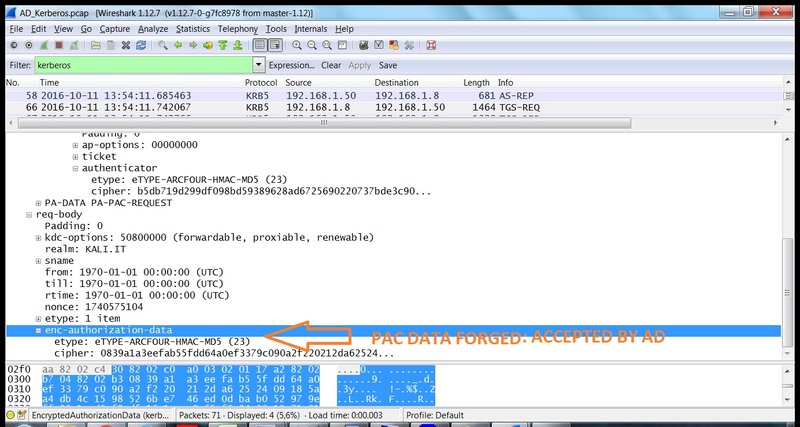 This PAC contains authorization data provided by domain controllers (DCs). The PAC is provided by DC in the field autorization data of the service ticket. It is signed with the KDC key (only the AD knows) and with the service key shared between the service for witch wants to be authenticated and the AD. The vulnerability MS14-068 published by Microsoft on 18 November 2014 permits with a valid domain user account to get administrator privilege creating a forged PAC, containing administrator account membership, inside a TG_REQ sent to KDC. The KDC accepts this forged PAC putting it inside a new TGT ticket released in the TG_REP. This ticket can be used for service escalation privilege asking to KDC a service ticket: in this case a smb service ticket. 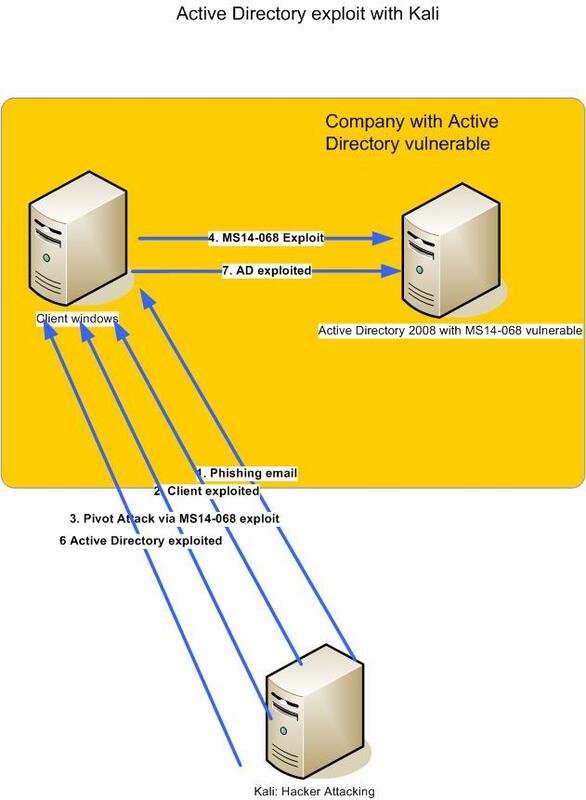 For understanding better the kerberos protocol you can read my article .http://www.securityandit.com/network/freeipa-active-directory-integration/. Let’s explain now how to get the privilege escalation using the kali linux. The first step of attack is to get a meterpreter shell using the metaploit framework already installed in Kali. For doing that, a social attack is executed: a mail with a excel malware is sent to victim. When the victims opens the excel malware, the visual basic script inside the document loads in memory a reverse shell-code downloaded directly by kali attacking linux. This is explained in my article http://www.securityandit.com/security/excel-malware-with-metasploit/. The request will be processed at a domain controller for domain kali.it. The only information missing is the user password that we cannot find without exploiting the system: let’s suppose to know it. Before executing this attack, a route is added for tcp forwarding to active directory by meterpreter shell: attack called pivot. The last piece of information for completing the attack is the service ticket. We want only to mount the C: directory of Active Directory and for that we need a service ticket to present to smb server of AD server. This service ticket contains the PAC already present in the TGT received above. For obtaining the service ticket another TG_REQ keberos packet must be sent to AD: it can be done with kvno command that connects to kerberos port that is 88: a port forward must be configured on the windows system exploited for this port. As shown the ip address of KDC is localhost that is forwarded due to rule added above to window client exploited. The service ticket can be asked by kvno. First change the krb5.conf for enabling the comunication to KDC only in TCP. It’s also possible to load the TGT on windows client system and using it for persistent attacks. It could be explained in next article. I hope that with this article the awareness about patching the system operating and the software in general is vital for avoiding devastating attack like that. The sensibility about a security approach in a company should be shared between IT departments and the other teams. I suggest to Administrator systems to organize periodically fake attacks by for example phishing email in order to spread a security culture in every company level. Please comment my article for any suggestion or question.